Would you like to make $100 in an hour answering some questions or giving your opinion with market research? Market research opportunities I did were always around the $100 per hour mark. They involved going into an office, an hour on the phone or an hour online doing something. 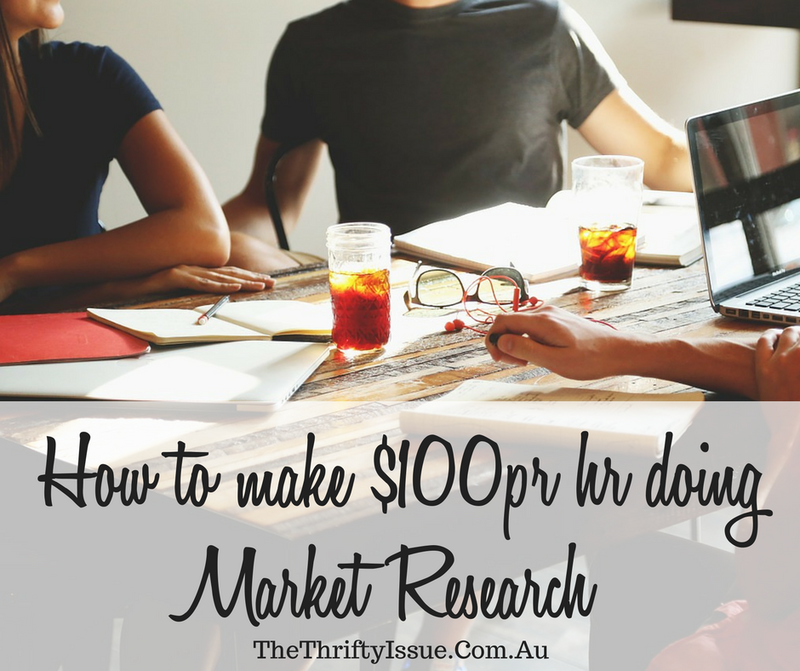 Getting paid to do market research won’t always mean $100 per hour and it isn’t consistent, it’s great when it happens though and is usually paid promptly. How much you earn depends on your availability and if you match profiles companies want market research for. While I often made $100 per hour, many other opportunities came up that were either product only (around $20 to $30 value) or which paid $150 for 2 hours. Like anything, you need to sign up to get involved. Farron Research was the best one I used in terms of cash payments, Social Soup was great for products like chocolate, yoghurt and muesli bars. Black Box is a newer one I have been involved in. They send me a box of goodies, I do a survey and there are ways to win extra things. Alway complete every aspect of your profile to get the opportunities that match you and your lifestyle. If you leave it incomplete, some companies won’t contact you at all. The high paying market research opportunities go fast so as soon as you see one apply for it. It takes a little time applying for them and you won’t be successful every time, but when it means $100 for 1 hour of work, it’s worth it. Be on time if you have to go to a location. Dress presentably, not necessarily in business attire, just be clean, clothes ironed, hair done, that sort of thing. It makes a difference to how often you will be asked back. Be involved, answer all the questions, be engaged in the conversations and don’t be afraid to voice negative opinions, just make sure you do it in a polite way or offer some solutions to the problems you see. After the market research project, you will be asked to do a quick survey about your experience. Provide honest, useful feedback where possible about how it went and you are more likely to be offered market research opportunities in the future. If you aren’t selected for a while, don’t give up. It took me a few months before landing my first $100 per hour market research job, but once I did, I got offered them on a regular basis. Market research isn’t reliable income, but the pay when you get jobs is generally pretty good. Be aware, you can often only do one in specific niches such as telecommunications once every 6 months. So if you do a survey on telecommunications, you won’t be able to do another on that for 6 months, but you can on other topics. It varies from company to company but seems to be fairly standard practice. Do you do market research? What tips do you have?